Sometimes you see a movie and you think, “there is no way they could have made that better.” Then you read the book, and everything changes. The Princess Bride is a classic film. It’s a charming, endearing tale of true love. It’s a great icebreaker date movie (not too serious, yet mushy), it was made at the peak of Rob Reiner’s career, it’s perfect for kids and adults, the characters are lovable — even the bad guys, the dialogue is fantastic, the effects were really good for the time it was made … clearly, there are a lot of reasons The Princess Bride is a great movie. One almost feels bad for people who don’t like it. It just automatically makes it seem like they don’t believe in true love, or they’re way too serious to be happy, or something unfortunate like that. The book it’s based upon is somehow even better. There’s just so much more detail to the book. These are so many little things that make the book awesome – like Buttercup’s parents, Fezzik’s and Inigo’s backstories and the speech Westley gives Buttercup when he finds out she loves him. There’s just so much that works in the book, and it was necessary to make some cuts for the film, of course, but everything seemed perfect. Plus, since the author participated strongly in making the movie, one could only assume that those were hard darlings to kill. The narration is also incredibly clever. 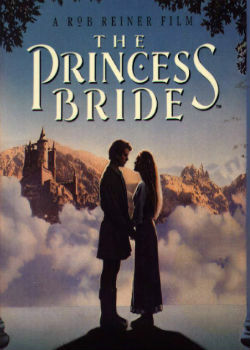 William Goldman is pretending that he’s abridged a very old fairy tale, and takes the opportunity to poke fun at old-timey storytelling (such as saying that the original author went on for dozens of pages about what one character wore). It’s a really silly idea, but it’s also hilariously original and very well-done. It’s also a very accurate depiction of what it’s like to have to sit through drawl old books for class. Though a clever idea for narrating the movie was used, the book’s narration was cooler in that sense. 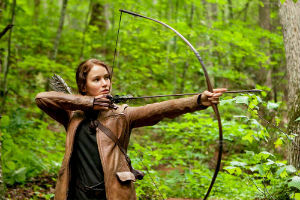 The Hunger Games was very cool. It was well-directed, even if the handicam did make some viewers feel a little sick. The right choices were made for what to keep in, leave out and add. Film may also be an even better form of media to portray the themes than novel. Film is a more obvious media for what Collins is making point of, and being able to see certain things really helps to drive the point home. The books ultimately had more to offer, though. First off, the kills were more authentic, because we got all the details of what happened. Censoring certain gory stuff is okay, but ultimately the books weren’t afraid to “go there”, and that makes a big difference. Also, many who had seen the movie but never read the book were left confused. Some things just moved to fast, and it’s likely the director and screenwriter were assuming that only fans of the book would show up to the movie. Though it wouldn’t feel rushed if you already knew what was going on, if you were new to the whole premise, certain tidbits of information would just about flash by. Ultimately, the series of movies could improve upon the books drastically, if they go into more depth with the ending. A lot of characters just kind of went away in Mockingjay, and as long as the already-short book is being split into two different movies, they might as well extend the epilogue so fans can get some real closure. Save for that one possibility, which is nothing more than a possibility, the book was better. This movie was decades in the making. It had to be done right, or there would be some unhappy fans to answer to. Luckily, it was pretty great. Asa Butterfield is possibly the best fit for Ender there could ever be, the most prominent themes were touched upon, and the mind game looked even cooler than I had imagined it to be when I read the book. Overall, Ender’s Game was a really cool movie. The book went above and beyond what the movie was capable of, though. There was a lot more to Ender’s inner struggle — his battle between selfishness and kindness, and trying to cope with how much better he was than everyone, at everything (sounds awesome, but…). Luckily the movie didn’t make him come across stuck-up. There was also a lot they withheld when it came to Ender’s brother Peter. Obviously they couldn’t dwindle on every detail, but some points were worth keeping in. for example, there was a part in the book about Peter’s enjoyment of the torture of small animals. It stood out, because we’ve all known bullies, we’ve all known kids that threaten to kill others, and who might even mean it under the right circumstances. There are very few people that will actually hurt an animal and enjoy it, though. That really drove home just how insane Peter was. He wasn’t just cruel and unnervingly smart. He was legitimately crazy. Some of the characters were also meshed together. Bean and Alai were very prominent examples. They’re both very different characters, and they represent different things in the book. 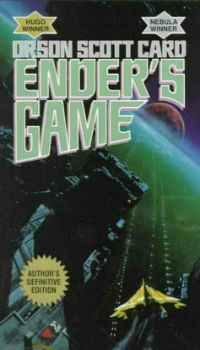 In the movie, they looked alike, sounded a little bit alike, and they were both just Ender’s generic bros. Alai was Ender’s only friend in the book. He was beyond sincere and incredibly loyal. Bean could easily have been in Ender’s shoes, if Ender hadn’t shown up. In some ways he was better than Ender, and his backstory is worlds cooler. It’s unfortunate those two were meshed into one, because it means an Ender’s Shadow spinoff is highly unlikely. Both the movie and the book were gorgeous. Every single high schooler should read it, and watch it, just to feel like someone understands their problems, and someone cares. The movie was actually written and directed by the author of the book, which is a huge bonus. The book is actually a bunch of letters written by the protagonist Charlie, so it’s very important this is brought to light in the movie. No matter how well the letters were integrated, it’d never be the same, though. That’s just the unfortunate truth. It was by far one of the best film adaptations of a book ever made, but letters are to be read, and that’s simply what works best. How many of these have you read/seen?